Two San Diego State University students, Sarah Wandersee, a doctoral candidate in geography and Steven Allison, a master’s student in geography, reflect on their 2012 research trip to China. As part of a $1.3 million grant from the National Science Foundation, the students worked at the Fanjingshan National Nature Reserve to study one of China’s national treasures and endangered species: The Guizhou snub-nosed monkey, often called the golden monkey. Account by Sarah Wandersee: This year, I registered to vote by mail for the first time because I was in China doing fieldwork from Oct. 17 until late on Nov. 6, Election Day. This was my third trip to our field site – Fanjingshan National Nature Reserve in Guizhou Province, China. It is a national reserve established in 1978 in the southwestern mountains of China to protect the Guizhou golden monkey. It also protects the more than 3,000 other plant, animal and insect species there. The reserve is a good example of an interesting difference between Chinese national reserves and the U.S. park system because people live within the reserve, sometimes in villages that are more than a 100 years old. This fall, I went to collect land cover data with Steve Allison, a fellow geography graduate student, to contribute toward a research grant. My other two trips to the reserve in China were in 2009 and 2010 as part of my dissertation research. Last time, I did a household survey, so I spent most of my time hiking to visit homes and interview people living in the reserve. This time, the work itself was very different and the area had drastically changed since the last time I was there! A lot of new roads had been built in the two years I was gone. This made it much easier logistically, but also meant we needed to update our files on the road network and use newer satellite imagery for certain analysis. Another difference was that some areas had been built up quite a bit, such as the growing tourist area around Heiwanhe, which had a lot of new hotels and houses. One other difference was personal; I had taken a few Chinese language courses since my last visit. This was incredibly helpful and I felt much less isolated and more confident in my abilities to figure out travel issues. It was fantastic to talk with our colleagues and hosts, even with my limited vocabulary and the challenges of the local dialect. It also improved our connections with the people we met. People appreciated my efforts to learn their language, particularly those people who remembered me from my last visit. Fieldwork is exciting because you get to be part of primary data collection and make your own dataset instead of using someone else’s nicely prepared data. This can be a blessing and a bane, experiencing excitement and frustration. 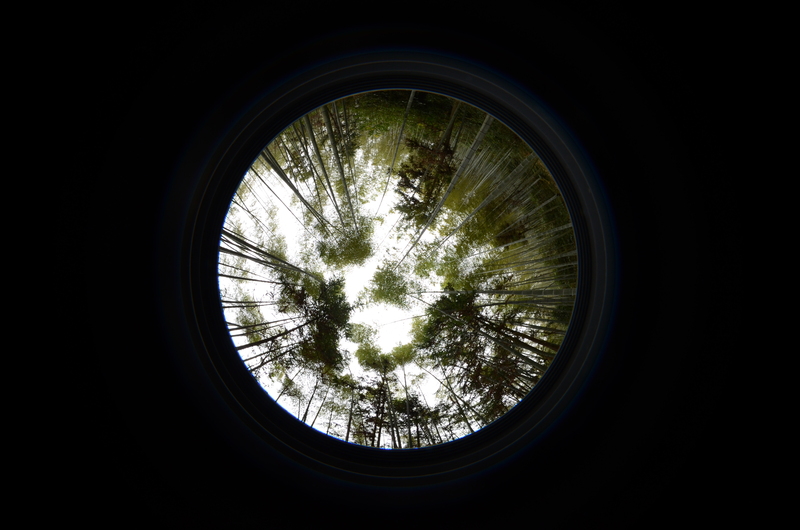 The data collection this time included measuring 30-by-30 meter plots within various land cover types and recording the species present, slope, and aspect of the plot, as well as taking photos of the canopy cover with a fish-eye lens (see Photo 1, Wandersee). One of my favorite aspects of the trip was getting familiar with the equipment and the data collection protocol. The other part I really enjoyed was working outside. For our work this time, we spent several hours most days hiking around the breathtaking mountains in southwestern China. 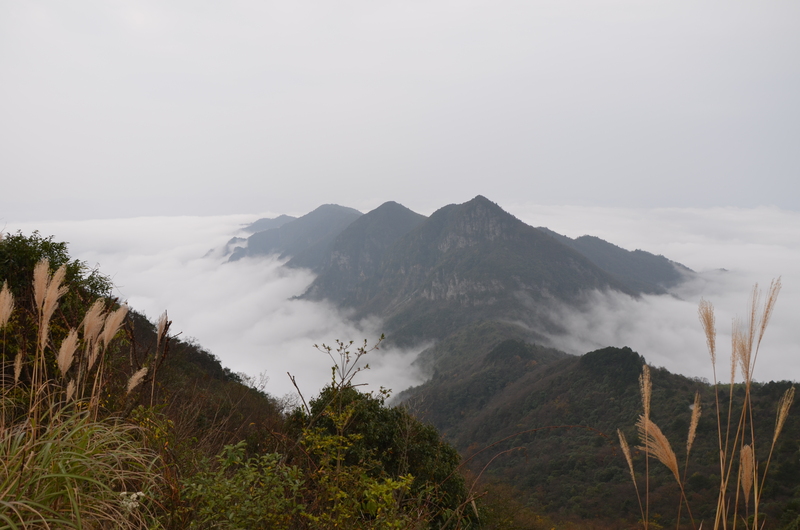 Fanjing Mountain is known for its unique beauty, like the many types of fog you can experience (Photo 2, Wandersee). Of course, we did not collect plots every day. We spent some time planning and processing data or traveling between sites. We also ran into problems with the weather. My trip to the field site took two days – flying from San Diego, to Los Angeles, to Guangzhou (China), to Guiyang (capital of Guizhou Province). From there, it was a six-hour drive to Jiangkou, the county seat and headquarters of the reserve. You can fly to a closer airport in Tongren, but the flights get cancelled a lot because of fog, especially in the fall. Sheilei, our reserve teammate, picked me up at the airport along with Mr. Yang, a reserve driver. Shilei is a biologist and worked with us on this trip to plan our fieldwork, collect plots, and organize data. Without his help, we would not have known which plants were growing where, or even which type of land cover we were in. Sometimes the age of the vegetation can make plots of the same cover type look pretty different. Shilei also made sure we stayed safe and healthy. When I first arrived at the reserve, I had dinner with Director Yang, formerly the head director of the reserve and currently the director of research. I also ate with his wife and Mr. Qiu, the head of Shilei’s department. They were all part of the original vegetation survey in the reserve, so it was great to hear about their experiences. In addition, Mr. Qiu came with us to our first site and helped with the plots there. Our first location was Lengjiaba. Unfortunately, we ran into a lot of rain and fog while we were there, so our plans got delayed a bit. In that season, there’s often rain and fog, but we wanted to time our trip so that we came after the threat of poisonous snakes and before the leaves fell. Shilei, Mr. Qiu, Mr. Yang, and I worked on the plots in Lengjiaba until it was time to return to Jiangkou so my fellow SDSU colleague, Steve could join us. While in Lengjiaba, we got one plot high up in the core of the reserve and actually heard the golden monkeys nearby. Of course, we couldn’t see them because of the fog, but it was an inspiring experience! Account by Steven Allison: Just a few weeks of geography fieldwork at the Fanjingshan National Nature Reserve really showed me a different side of China. The holy Buddhist mountain at the center of the reserve seemed distant from the sprawling, bustling cities I’d lived in while I was studying Chinese. Accessing data on vegetation types, color, and health, to map land cover change over 40 years in the sensitive ecosystem, meant fellow Geographer, Sarah Wandersee, and I hiked deep into the hills themselves. We stayed with some of the park residents whose home we were studying. Many of them belong to the Miao and Tujia minorities, and our mutual enthusiasm for getting to know each other through our work meant that my first fieldwork experience was full of new foods, ideas and discoveries. 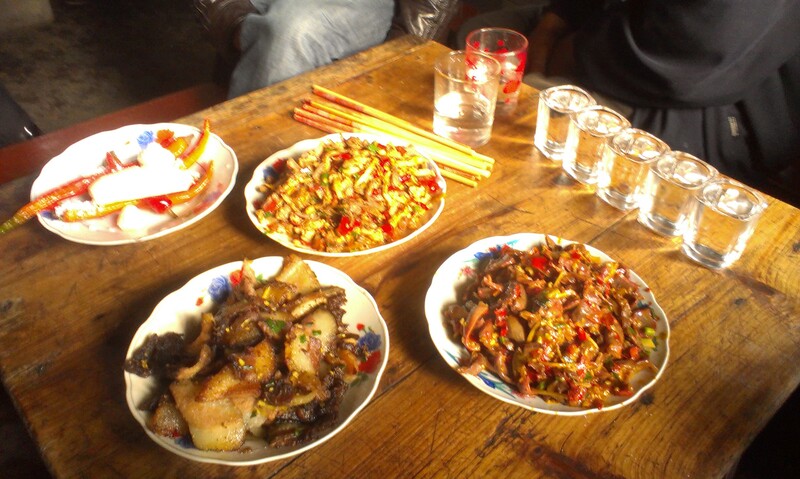 Guizhou food is famously sour and spicy, accompanied by green tea during the day and sometimes local baijiu wine at night. Our hosts cooked dinner when we came down the mountain and we sometimes descended through farm plots to see the cook picking the night’s vegetables: the agrarian fare of northwest Guizhou is farm fresh, local, and organic (photo 1, Allison). When dinner included meat, it was from the farm next door. Although over-gathering of wild plants threatens monkey habitat, many herbs have deep significance. Some meals with minority representatives and park rangers involved discussions on how to negotiate the needs of conservation and traditional culture. While dishes like smoked pork and spring onion, or wild mushroom, garlic and red chili were presented as continuities of hundreds of years of Miao and Tujia culture, the high-end, handmade teas they offered with pride represented some modernizing aspirations. Growing tea instead of more resource-intensive cash crops eases pressure on native vegetation. Some enterprising park residents have embraced this possibility with enthusiasm and produced new kinds of teas with traditional techniques borrowed from neighboring areas. Satellite photography mapping the people’s changing land uses fit right into many people’s ideas of new techniques working with traditional ways. I hadn’t expected such interest in our research or how much our goals in preserving monkey habitat aligned with those of the locals. My first fieldwork experience featured a lot of cooperation with residents and park management. Contrary to some previous experiences with Chinese government officials, I found the experienced rangers and police dedicated to both environmental and cultural conservation. 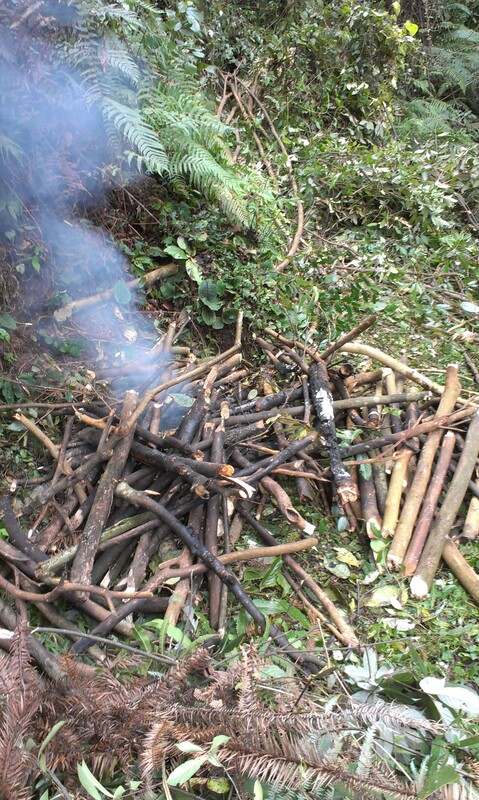 One afternoon, on a densely wooded ridge, we spotted a fire that had been set in the protected zone, part of a now illegal charcoal creation method. Our botanist counterpart, Shilei, and police guides hurried to put out the fire, carrying creek water in empty cracker bags (photo 2, Allison). Although we didn’t see anyone when we arrived, we saw two old Tujia women as we hiked down. My guides decided it was most likely the women who had set the fire, but since it had been put out early and the police now knew a common fire setting location, there was no reason to pursue the case. Monitoring the location meant they could prevent fires in the future, which was preferable to prosecution. One thing I learned about fieldwork was that it requires a lot of transit time. However, that also meant there are a lot of new discoveries that occur while getting from one place to the next. A new discovery for me was when a local police officer told me that he was a big American movie fan. We learned that we were both anticipating Tarantino’s new film. That led us into a discussion of which American directors would be best for which Chinese movies (it was Spielberg and the Battle of Red Cliff, by the way). The fact that our time there overlapped with the U.S. election led to a comparison of government systems and some of California’s 2012 propositions. 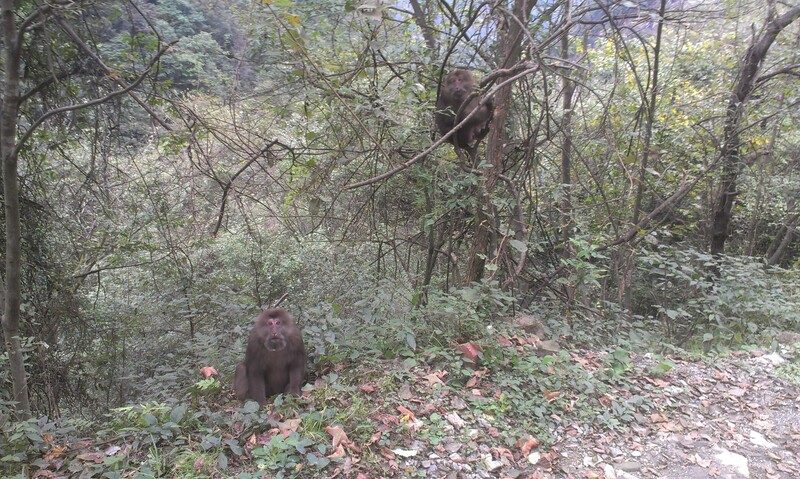 One drive was punctuated by a sighting of some macaques (photo 3, Allison). We were even able to visit a school working with the San Diego Zoo’s Education Outreach program and chat with children about the environment. It turned out that our primary goal of collecting data about Golden Monkey habitat was only part of doing fieldwork. There is still so much to learn in Fanjingshan Natural Nature Reserve.